The following excerpts are from 4 of my favorite books of 2015. Please send me yours before the end of the month to include them in an interactive blog post! Have you ever read a book that you knew had changed your life? 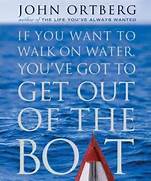 For me, “If you want to walk on water, you’ve got to get out of the boat” by John Ortberg is such a book. It profoundly changed the way I look at my relationship with God and the relationships in my life. The reference to “walking on water” comes from the Biblical account of Peter’s encounter with Jesus on the Sea of Galilee. First Jesus had to get the apostles’ attention Then, because He wanted them to do something extraordinary, He told Peter to “Come” and “Do not be afraid”. Wow, now that’s what is called a tremendous opportunity! Ortberg goes on to explain about water-walkers and we discover what our boat represents. He talks about the fear of leaving our comfort zone, of the challenge of risk, of “seeing the wind”, of learning to wait, and finally, our response. For those of you, who are wondering why I would recommend a “religious” book, well, I’ll tell you. The author, without being “Preachy’, takes you on a great adventure. He invites you to pack your bags and take a risk. I had always been shy around people I did not know. If attending a meeting, I always scanned the room for someone I knew first. I hardly ever volunteered to do something out of my comfort zone. My “boat” was fear. After reading this book, I became more assertive, friendly and I took on assignments at work and church that had once terrified me. I now recommend this book to everyone I meet.